As a soldier in Germany’s Imperial Army during WWI, painter Max Rothman loses his arm in the army’s crushing defeat at Ypres. A few years later, he and another soldier, Adolf Hitler, meet again back in their home town, Munich, in 1918 as the young Hitler decides to pursue a career as an artist. Max explores the acquaintance of this unlikely pair, one rich and one poor, and asks what might have happened had Hitler become a serious artist. 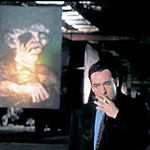 John Cusack is the fictional Max, a privileged young Jew having lost his arm and therefore his own career as an artist. With the support of his wealthy family after the war, Max becomes an art dealer and sets out to make his fortune. Hitler (Noah Taylor), meanwhile, lives in penury, embittered by Germany’s losses in the war. Young Hitler wants to express what he saw in the trenches in his drawings, but he is also compelled to express his strong feelings about his nations sudden decline on the world stage. The Treaty of Versailles, in which a defeated Germany is forced to cede large portions of its territory to France, Poland, and other nations, as well as accept responsibility for war reparations, only sharpens Hitler’s fury and humiliation — and his desire to use his art to affect politics. Hitler and Rothman become acquainted when Hitler asks Rothman to try to sell his artworks. Rothman encourages and befriends him, advancing him money and agreeing to represent his work. Their relationship provides a focus for some of Hitler’s class envy and his obsession with “purity of blood,” which he and other Aryans have decided is the secret of the Jews’ financial success. Initially Hitler insists that he is not anti-Semitic, but his belief in the supremacy of a pure race is ultimately incompatible with his early stance. And anti-Semitism is what riles the crowds in the streets and beer halls. Though Rothman urges him to create new art and find his voice, Hitler is torn. He is just starting to speak for his comrades, and learning to wield the tools of propaganda. Artistically, Hitler remains blocked until he begins to sketch the icons and symbols that he believes would have the power to unite a new state: the reversed Sanskrit sun sign, eagles, and even the colors of the military uniforms. One of Rothman’s final acts in the film is deciding to give Hitler a show. Rothman ignores the meaning of his work and praises him as a bold futurist, yet one whose ideas are too absurd to be anything but an artistic statement. John Cusack’s performance as Max Rothman shows some of the actor’s trademark sharp-witted energy. His characteristic charm supports a convincing intellectual presence. Cusack shows the tension in Rothman’s not-always-successful attempts to remain both engaged in his life as a husband and art dealer and detached enough to function after losing his own opportunity to be an artist. Noah Taylor makes a convincing propagandist. His jealousy of Rothman’s wealth and privilege foreshadows the sense of injustice that later fuels his political activism. Without much to hold onto in his postwar home, he is susceptible to the effects of the early Aryan propaganda, and he is convinced that his politics are the stuff of his artistic expression. He is frighteningly fervent, speaking throughout like a man whose teeth are causing him great pain. Leelee Sobieski is not quite convincing as Liselore Von Peltz, the sultry artist siphoning Max’s attentions away from his wife. In one scene she warms her apartment for their tryst by throwing fuel on the floor and throwing a lit match on it. “I imagine it would be altogether too bourgeois to turn on the heat,” Max says wryly. Director and screenwriter Menno Meyjes paints a portrait of life in this era with a delicate hand. He shows Rothman and his extended family in their exquisite home while Hitler simultaneously speechifies to soldiers in the streets below. A disturbing montage results from the intercutting of Rothman and his father-in-law at temple and one of Hitler’s early speeches. He illuminates the fragile relationship between the philandering Max and his wife in a beautiful scene in which Nina lets him know just how much his extracurricular antics affect her. Max looks at a turning point in history about which so many have since asked: What if? What if instead of the rise of the Young Socialist Party someone else had become popular? What if Hitler’s rhetoric had fallen on less sympathetic ears? This film asks us: What if Hitler had become a commercial artist instead of the megalomaniacal German who unleashed the Holocaust on his people? Max succeeds in portraying life in Munich at the moment when the National Socialist Worker’s Party enlists Hitler to help with its propaganda, and we all know what happened next. This film has unleashed protest and criticism from many who have not even seen it for daring to humanize Hitler and examine who he might have been before he became a figure who represents true evil to millions of people. Yet despite the controversy and a tragic ending that foreshadows the precipitous fall of the wealthy German-Jewish upperclass, this film left me cold. Neither Hitler’s work as an artist nor the relationship between Rothman and Hitler promised by this film were ever developed fully. While Rothman and Hitler have some interesting discussions they lack enough in common to develop a real connection, nor was I ever convinced that Hitler’s kitschy work would truly have attracted the attention of a sophisticate like Rothman. Max is a fine portrait of a critical moment in modern history but falls short of its lofty goals.